This over top triple animal prints (zebra, leopard & giraffe) is definitely for the person who LOVES animal prints. 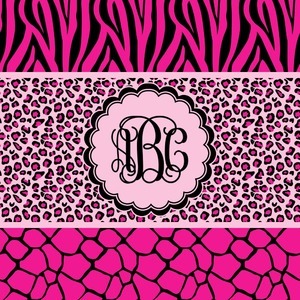 The design has zebra print on top, leopard print in the middle and giraffe print on the bottom. We chose to feature this design in black, hot pink and baby pink, however, the design is completely re-color-able, so you are able to select any color combinations you desire. Also the order of the pattern is also customizable. We chose to use our scalloped circle label with an interlocking monogram. PS - we have many other animal prints in our system i.e. snake, cow, reptile, tiger etc. for you to also choose from.